Stay calm. Be polite and friendly. Smile. Get the caseworker’s business card. Excuse yourself briefly and get a phone or other device to record your conversation. This recording could be used as proof should the investigation escalate. When you begin recording, state your name, the date and ask each person to give their name and title as well. Do not allow CPS workers to interview your children. Tell CPS workers you are willing to cooperate if they will tell you what the charges are. If there are allegations of physical abuse or neglect, tell the caseworkers you will take your child(ren) to your physician who will then write a report to CPS. Stand your ground. Do not be afraid of silence. How Can THSC Help You During a CPS Investigation? If you get a call from CPS, being a THSC member might be the greatest asset in your arsenal. THSC members are provided with a 24-hour CPS hotline to call in emergencies. 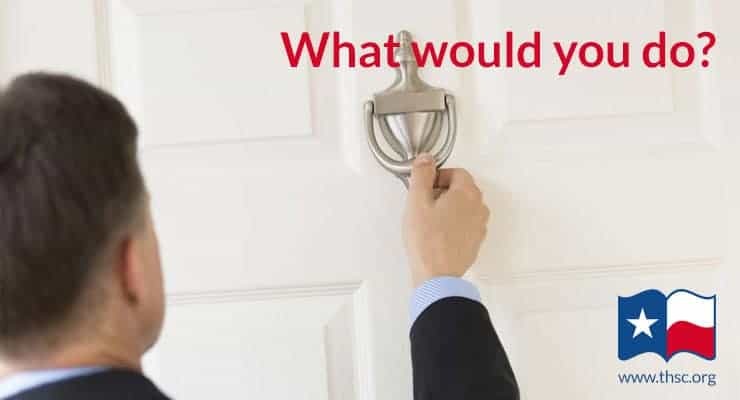 If CPS knocks on your door, a THSC representative will walk you through every step of the process and connect you to our attorney, THSC’s CPS special counsel Chris Branson. After first reading about the Tutt family’s CPS case, I remember imagining how simply I could be reported to CPS for child abuse. Like the Tutts, we have a child with special needs who can easily find herself in interesting and unusual situations and left to her own explanation, that situation could really make me look like a neglectful or abusive parent. You see, she seems to speak wonderful English and has a charming personality, but after arriving for the first time in America only four years ago as a seven-year-old newly adopted girl with no English-speaking skills whatsoever, her vocabulary and cultural astuteness are quite lacking today. Don’t get me wrong, she doesn’t mean to confuse you, but she does. For example, she’ll describe all vehicles as cars: the 18-wheeler is a car, the Texas truck is a car, the convertible is a car. So, if you’ve been in a disciplinary situation with a guilty child, you can imagine predicting her explanation to an authority without understanding the whole situation could be of concern. Hit, slammed, poked, smacked, touched, tickled, patted, spanked, punched, bonked, banged … it’s all the same to her. But it wasn’t all the same to the nurse counselor at her special needs camp the week before the man with the Department of Family and Protective Services badge showed up at my door. I had just finished catching up with social media, which just so happened to include the most recent viral article about a “CPS nightmare,” when our doorbell rang. The house had not quite recovered from the weekend and with my bedhead, morning breath, and comfy sweats-clad self, I answered the door expecting to tell the man that we did not need pest control, weed-eating, etc. However, I immediately recognized the badge. I had just read that acronym in the CPS nightmare article. I’m sure I looked dazed and confused. Honestly, I don’t remember much of what he said. I tried to remember everything that THSC instructed on their website for these exact situations (by the way, one of the things is to write down everything that was said). He told me very politely and courteously (he didn’t quite fit my nightmare scenario) that I had been reported for child abuse and that he would need to interview all of my children individually. At this point the kitten started to escape and my oldest came to me saying something–probably something about his math problem or his little brother leaving his underwear on the floor. I shut the door, biting my lip to keep my composure as I walked quickly back to my room to get some privacy and recollect. My first thoughts: I’m a THSC member right? They offer legal assistance for this exact situation right? What was that number I’m supposed to call? Should I call them first or should I call my husband? He called pretty quickly after that. Fortunately, he’s a very calm and level-headed man who knew just what to say to me: “I support you. We will get through this together.” That’s when I lost it. I told him the situation and said I thought we should call THSC right away. He agreed and I called THSC. I spoke with a woman (probably a good thing so she could understand the talking while crying thing) who said she’d give my message to the attorney, who was in court at the moment, and he’d return the call by the end of the day. Then, being a homeschooling mom, I had to somehow get back to my kids and return the house to some sort of order (you know what happens when mom disappears for a while with no indication of returning). I found a moment alone with my daughter and asked her some questions about camp. I asked her about her counselors and what they talked about. That’s when I figured it out. The week before she left for camp, there had been an incident with an upset mom and a disobedient child at four in the morning. Nothing abusive had happened. After hearing her retelling of that early morning, coupled with her limited vocabulary—remember, a “spank” is the same as a “hit” to my daughter—it could sound abusive with a poor choice of wording. We tried to go about our day—but let’s just say, not much schooling happened that day. When THSC’s attorney called back a couple of hours later, I had gathered myself enough to explain the situation without crying again (thank goodness!). He knew exactly what to do. I immediately felt relief and comfort. This man knew how to handle the situation and knew how to protect my family. I immediately felt like I had a team and the coach knew exactly how to play the game. He told me the game plan. You see, that was the worst part of the whole experience. I began questioning everything about myself. I even began to wonder if it would be best for the children if they were taken from me. If I sounded at all like I abused my children, then maybe I shouldn’t be their mother. Thinking back on it, the thoughts all sound absurd now. Thank God THSC offered me the legal assistance I needed, because it took all of my energy and attention just to cope with the spiritual and emotional part of this situation. My ability and adequacy as a mother had been called into question. If you’ve ever dealt with feeling inadequate as a mom before, the addition of being accused of child abuse can seem overwhelming. Knowing that I had a lawyer handling everything with CPS, I felt the freedom to hash some issues out with God. Don’t get me wrong, we gave the legal stuff to God on that first phone conversation with my husband. But being able to let go of the legal mumbo jumbo and just focus on my family served our family immensely. THSC is not kidding when they say they are Keeping Texas Families Free. They freed me to search my heart and make me a better mom. Today, we received notice that I am in fact not guilty of child abuse. It took some time and some interviews of each individual in our family in the presence of the lawyer THSC provided, but it is done now. And I am relieved. I did cry again: tears of joy. I am rejoicing that God used THSC to protect my family. I am grateful that we are members of THSC. Soon, THSC will be receiving our check for a lifetime membership. I implore you to protect your family and join THSC. Or, simply support the funding that provided the attorney for my family. I will be forever grateful to you. Thank you! And thank you, THSC, for Keeping Texas Families Free. You can read more about the Tutt family and their battle with CPS here. Since 2014, THSC has helped resolve 41 CPS cases for homeschooling families. As of the end of the second quarter of 2018, THSC has eight ongoing cases where we are representing families during CPS involvement. Like the Tutts, these families have been targeted wrongly. Whether because of a false report made to CPS or because CPS or a judge overstepped their authority, these families have been forced into the traumatic scenario of having to defend their right to raise their children. THSC’s mission is to ensure that these families receive justice. In addition to fighting in the courts to defend family rights, THSC works hard in the Texas legislature to resolve problems with Texas law that have contributed to many of these situations. In 2017, THSC and the THSC Watchmen team succeeded in passing nine CPS reforms which fixed several loopholes or problems with Texas law to ensure that families are given proper procedural protections during a CPS investigation or lawsuit. You can read a detailed account of these reforms at our 2017 Legislative Victories page. Why is THSC Involved in CPS Issues? THSC was founded in order to protect the right of Texas families to homeschool their children. Our motto is Keeping Texas Families Free. 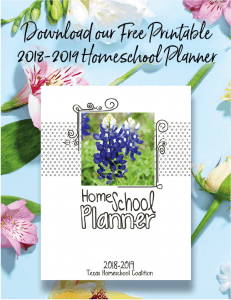 In the last few decades, we have succeeded in establishing a strong precedent for homeschooling in Texas. In recent years, however, the battle for homeschooling has begun to change. No longer do we see major, direct attacks upon the right of parents to homeschool in Texas. Instead, the attacks are coming through the family courts. Judges and caseworkers (often with a strong bias against homeschool families) challenge the basic presumption that parents have the God-given right to raise their children or to educate their children at home. The right to raise our children in the first place is the foundation of our right to homeschool. For this reason, THSC expanded our mission statement to include the protection of each family’s right to raise their children. We believe that the best place for children is in a home with a loving family. If you do too, please stay informed and be prepared to contact your legislators in support of CPS reform legislation by signing up for THSC legislative, advocacy and political updates.